Who needs the Gini coefficient? No, it has nothing to do with rubbing a lamp and making wishes come true, although that’s what I do every night. The Gini coefficient measures how income is distributed in a society. Last year, managing director of the Monetary Authority of Singapore Ravi Menon said that Singapore’s Gini coefficient, after taxes and transfers, has improved from 0.41 to 0.36. This suggests that the income gap in Singapore has narrowed, but there are debates over how accurately the Gini coefficient reflects real life. 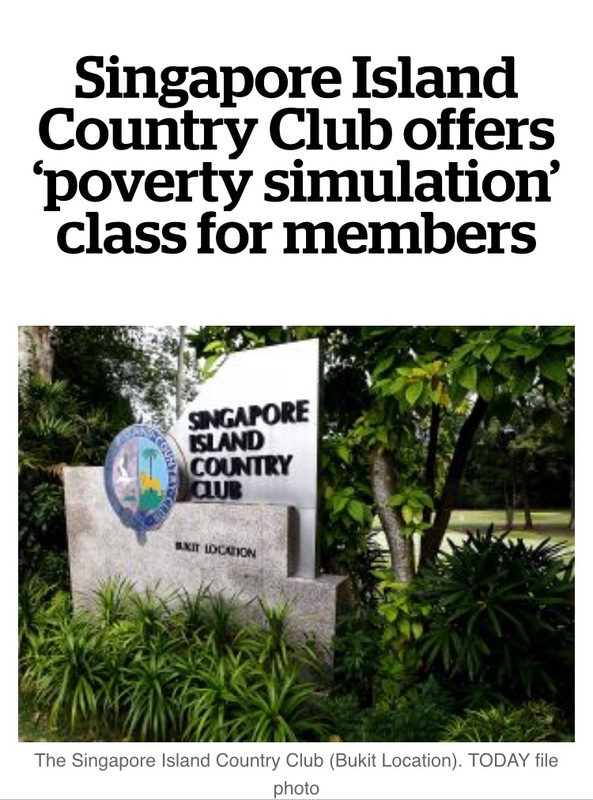 I say the best measure of the income gap is the number of country clubs organising poverty simulation exercises for their members. So far, I count one — Singapore Island Country Club. What is this “poverty simulation” anyway? Is it played on a computer like a flight simulation? Or is it like dying your dogs’ fur to simulate pandas? 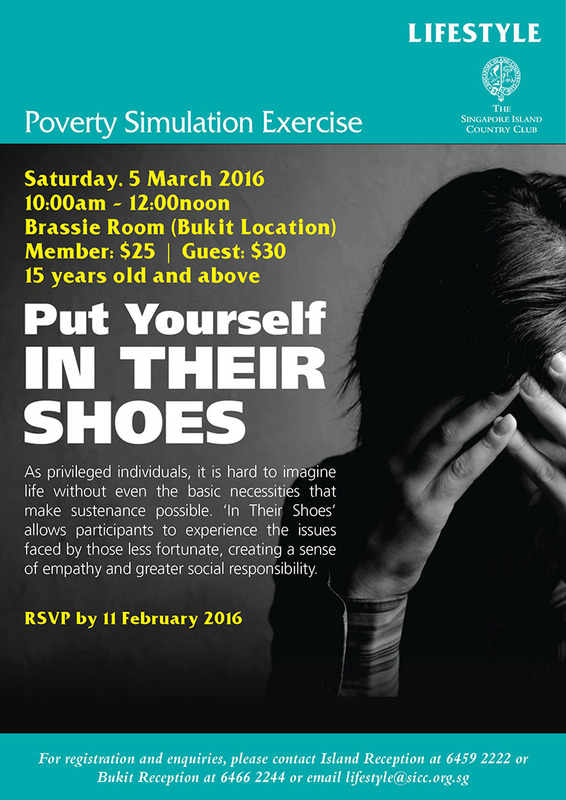 The exercise will be held on March 5 from 10am to noon in the Brassie Room of the club’s Bukit Location. Members pay $25 while guests pay $30. Please RSVP by Feb 11. So for $30 or less, you get to experience something for two hours that many get to experience for free for a lifetime. What a bargain! Considering that the poverty simulation exercise is targeted at “privileged individuals”, the organisers could have charged the country club members way more than $30 for the privilege of pretending to be poor and donated the extra money to help people who are actually poor. But since the exercise is conducted by Methodist Welfare Services (MWS), such price-gouging probably wouldn’t be very Christian. Although MWS has conducted the exercise since 2011 for church members, schools and other volunteer groups, this is the first time for a country club. Today newspaper, which first reported the “news” last week, said that even the club members had mixed reactions to the poverty simulation, “calling it a good effort on the part of the club, but pointed out the club could go further and organise more community service activities”. Yes, one rich guy actually said that it would be good to experience being poor again since he was once poor himself. Hey, who doesn’t get nostalgic for poverty? 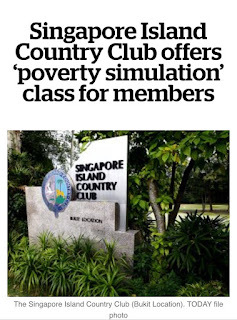 Blinded by good intentions and a bourgeois lack of self-awareness, the club failed to foresee how condescending and insensitive the headline “Singapore Island Country Club offers ‘poverty simulation’ class for members” would make them look. As if we don’t have enough reasons to resent the rich. Others suggested a “wealth simulation exercise” for the poor to even the score. I think we had something like that last year when 42 underprivileged kids were driven around in super expensive cars such as Ferraris, Maseratis and Porsches owned by rich people. Organised by the Industrial and Services Co-operative Society, which helps ex-offenders and their families, the well-intended event was criticised for being “distasteful” and “morally wrong”. It seems no matter how they try to do the right thing, rich people just can’t catch a break. We have the Gini coefficient to measure the income gap. Now if only we have something to measure the blitheness of “privileged individuals”. We can call it the Country Club coefficient.